Blessed thistle deserves its beautiful name which it earned because of its age old reputation as a cure all. While it may have a prickly appearance, it is full of healing properties that can help treata range of conditions from liver health to menstrual troubles and can even promote lactation and wound healing. If you are unfamiliar with this wonderful healing herb then read on to find out exactly what it is used for and how you can use it to get the most from it. If you have never heard of it, blessed thistle is a medicinal herb found in Mediterranean areas as well as parts of Asia. Also known as holy thistle or by its scientific name – Cnicus Benedictus, the plant is a member of the asteraceae family and is related to artichokes and milk thistle. By the middle of the 16th century, the plant was cultivated widely around Europe, especially by Benedictine monks in monastery gardens. The plant earned an excellent reputation for its healing abilities and it was given its Latin name of ‘Benedictus’ or Benedict’s thistle. Blessed thistle was eaten raw or cooked but was also ground up into a fine powder then added to wine or tea to stimulate digestion and appetite or to reduce fevers. Blessed thistle is still a popular herbal remedy to improve digestive health but it is also used to support liver and gallbladder health and is found as an ingredient in various formulas. Blessed thistle has a very long history of medicinal use dating all the way back to the Middle Ages. Blessed thistle goes by various other names including St. Benedict’s thistle and Holy thistle because of its association with the Benedictine monks. These days, you can find blessed thistle in a variety of supplementary forms including teas, capsules and tinctures. Blessed thistle is a member of the Asteraceae family. The plant is native to the Mediterranean regions of Europe and Africa, Western Asia and Eastern areas of the USA. 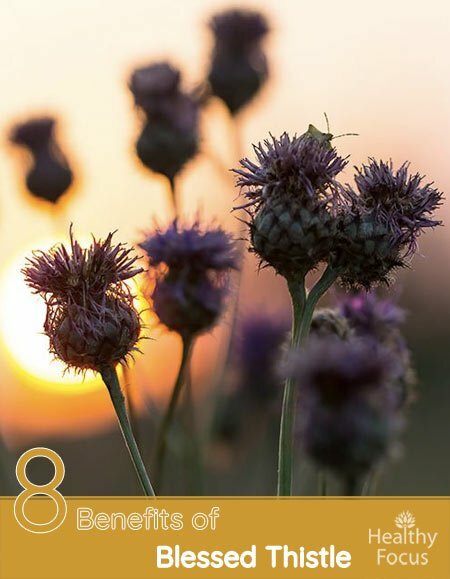 Historically, blessed thistle was used to treat a range of conditions including fever, cholera, digestive troubles, flatulence and stomach upsets. As well as being prescribed by herbalists as an internal remdy, it can be applied topically as part of a poultice to treat wounds. Blessed thistle contains certain bitter glycosides which can help stimulate athe appetite and work as general digestive tonic. Historically, people took large doses as a diaphoretic. More recently, blessed thistle has earned a reputation among herbalists for its beneficial actions on the kidneys and the liver. Why is Blessed Thistle Good for your Health? Blessed thistle is regarded as an excellent general tonic for your health with a good range of medicinal benefits. It contains a variety of therapeutic properties including antimicrobial, emetic, diuretic, diaphoretic, astringent, emmenagogue, vermifuge and galactagogue properties. These natural actions are what gives blessed thistle so many of the medicinal uses including for jaundice, arthritis, fevers and dysmenorrhea while it can also naturally boost a woman’s lactation. Blessed thistle also contains a variety of essential nutrients like calcium, potassium and manganese while it is also home to various antioxidant flavonoids and plant lignans. Perhaps the best-known and most popular use of Blessed thistle throughout the years is as a digestive tonic. Blessed thistle offers excellent support for your digestive health and can help treat a wide range of common stomach complaints. Many people drink it in the form of a tea before eating their meal to help prevent indigestion, gas and bloating. Blessed thistle has also been used since ancient times to promote a person’s appetite which is particularly useful for people struggling to eat following surgery or a bout of illness. This bitter herb has cholagogue properies meaning it can help to stimulate the body’s production of bile while a compound called cinincin helps to stimulate the production of saliva and gastric juice. By stimulating these fluids, the body is able to digest the food and you consume far more effectively. As well as aiding the digestive system, these actions can reduce the risk of liver illness and gallstones. The need to detoxify the body in general and the liver in particular is well known. We put a great deal of strain on our livers because of lifestyle and diet factors but your liver’s health is absolutely crucial to your overall health and well-being. You will find blessed thistle used as an ingredient in many herbal formulas designed to cleanse the liver. Because of its ability to stimulate the production of bile, blessed thistle is an excellent natural way to detox the liver and to take care of the organ’s health in general. Some experts also believe it can be used to treat jaundice. Given the choice of feeding their child with formula milk or natural mother’s milk, the vast majority of women would choose the latter. Unfortunately, not all women are able to produce milk in sufficient amounts to feet their babies properly. Fortunately, blessed thistle is one of a number of natural remedies that have galactagogue properties that stimulate the production and also the quality of breast milk. Make sure that you consult your doctor before taking this or any other herbal remedy because there is a lack of research into its safety. Unfortunately, a lot of women will suffer from various horrible symptoms every month as they go through their menstrual cycle. Blessed thistle is believed to help women in a variety of ways. According to traditional use and anecdotal evidence, blessed thistle may help to alleviate some of these monthly symptoms including headaches, brain fog and the all too familiar cramps. Blessed thistle has antimicrobial, anti-inflammatory and antimicrobial actions that can help benefit the skin. It also contains various antioxidants that help keep the skin looking fresh and young while its astringent actions can help tighten the skin. As we have already mentioned, blessed thistle is a member of the Asteraceae plant family and while no studies into its effects on the skin have been done, there is encouraging evidence from other members of the same family. Blessed thistle can be applied in the form of a poultice to help treat minor wounds, cuts and grazes and may help prevent infection from taking hold. Inflammation is at the heart of the majority of illnesses including serious illnesses like cancer, heart disease and dementia. it is important therefore to get plenty of anti-inflammatory foods into your diet to help reduce the risk of these diseases. Blessed thistle is one such anti-inflammatory herb. Blessed thistle may help the body in its fight against dangerous microbes and bacteria. It contains two compounds called polyacetalyne and cnicin which scientists have examined for their antibacterial effects. According to the research done so far, these chemical compounds have proven effective against various harmful bacteria including E. Coli, Staphylococcus aureus and Bacillus subtilis. A diuretic is a substance which helps stimulate the production of urine and increase both the flow and frequency of urination. Diuretic medications are prescribed for various illnesses often those related to the kidney and infections of the urinary tract. Fortunately, there are plenty of natural diuretics that you can use as an alternative to powerful pharmaceutical medications and blessed thistle is one of them. Blessed thistle is commonly drunk in the form of a tea but is also available in supplementary capsule or tincture form. For supplements a dose of between 1 and 6 grams each day is considered safe for the vast majority of healthy adults. If herbal healthy herbal teas are your thing, why not try a cup of blessed thistle by following these very easy instructions. Boil up a cup or so of water and add half a teaspoon of the dried herb. Allow the herb to steep for a good ten minutes before straining it out. To be absolutely safe, do not drink more than 3 or 4 cups a day. As well as drinking the tea, you can use it to treat minor wounds, injuries and bug bites. Soak a washcloth or thin towel in a pot of your herbal tea. Wring out any excess liquid and apply it to the affected part of your body. Hold in place for a few minutes and repeat several times a day until it has healed. What is Blessed thistle mostly used for? Blessed thistle is used to treat a variety of conditions but is probably best-known for its beneficial actions on the digestive system. It can improve general digestion and relieve many common digestive complaints. It also helps to stimulate the appetite which is useful for people undergoing chemotherapy treatment or people recovering from illness. Blessed thistle is also used to cleanse the liver, stimulate lactation and topically to treat wounds. What are its active chemical constituents? Blessed thistle’s chemical constituents include sesquiterpenes like cnicin, absinthin andpolyacetylen. It also contains triterponoids such as a-amyrin acetate and a-amyrine and various lignans including arctigenin, flavonoids and tannins. Cnicin has been identified as the main bitter ingredient in the herb. Blessed thistle is available in supplementary capsule and tincture form. It is also used to make a healing tea. When it is taken in the appropriate dosage, blessed thistle is generally considered a safe herb and the chance of any adverse side effects are low. In very high doses, it may cause stomach irritation and could interfere with antacid medications. Pregnant women should speak to their doctors before using blessed thistle supplements. Is it the same as milk thistle? Blessed thistle belongs to the same family as milk thistle but they are completely different plants with very different medicinal properties. Where can I get Blessed thistle supplements? You can easily find blessed thistle supplements online and in many health stores around the country. Read the online reviews to make sure you are buying a quality product from a reputable manufactures. Blessed thistle is generally considered safe for most adults so long as it is taken in suitable doses. There are however some precautions that you should be aware of. In very large doses, blessed thistle may cause stomach irritation. Pregnant women should not use the herb without consulting their doctor. Nursing moms should also consult their medical provider before using the herb despite its well-known ability to stimulate lactation. There is no safety information regarding the effects of the herb on children. People with certain pre-existing intestinal conditions such as ulcers or IBS should be careful as the herb may further irritate the stomach. Because blessed thistle increases the production of stomach acid, it may interfere with medication prescribed to reduce acid. Blessed thistle is a plant with a beautiful name and a very distinguished history of medicinal use. It was traditionally used to treat digestive conditions as well as issues with the liver and gallbladder. These days, blessed thistle is available in supplementary form and contains a variety of medicinal properties. They include antimicrobial, diuretic, emetic, astringent, vermifuge and galactagogue properties. Blessed thistle can be used for a variety of medical conditions. It is mostly used to treat digestive health and as a tonic for the liver but is also used to treat arthritis, jaundice, fevers. Women can also benefit from this herb and it is often used to treat issues affecting women like dysmennorrhea and to promote the production of breast milk in nursing mothers. Blessed thistle is generally considered to be safe but there are certain precautions to be aware of. Even though it is used to boost milk production, pregnant women should always consult their doctor before using this or any other herbal remedy. Have you ever used blessed thistle in tea form or any other supplementary form. Please let us know what you used it for and whether or not you found it to be effective. We would be delighted to hear from you.